Those are a few I use a lot but there are many others. DIY FS has great flavors, they’re just really expensive which is even better a reason for you to ask this question you poised. Anytime, chime me in if you think I can help. Thank you very much for the replies and help! Much appreciated! Definitely wanted to get others opinions before the order was placed lol! @Beaufort_Batches @fidalgo_vapes thx a bunch! Have you tried any of their custards or creams by chance? 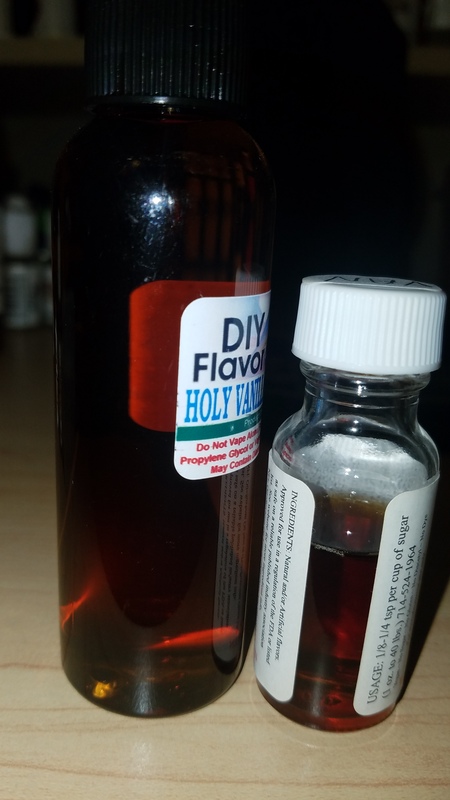 @Beaufort_Batches regarding DIYFS flavors & the higher prices, you may be able to find some similar flavors from the vendor GetSuckered.com. They also have their flavorings divided by base, so stay away from the soybean oil, unless you’re baking with them. Give them a gander and if someone runs across the source for Holy Vanilla, please share, looking high and low for it. I have not ordered from GetSuckered.com for any flavors. However I think his comment is worth noting. 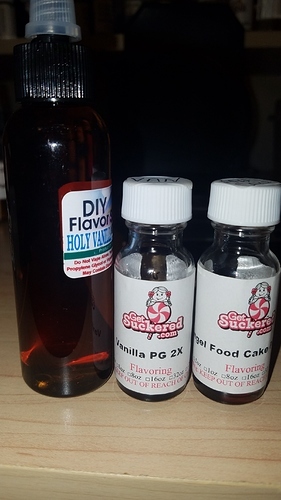 DIY flavor shack has holy vanilla in stock! https://www.diyflavorshack.com/SearchResults.asp?Cat=537 also thx for the information you gave! Must agree with @Beaufort_Batches the Holy Vanilla, Pound Cake, and Gooey Butter Cake are all really good. I also really like they’re pretzel. You have to mix it kind of high but its really a pretzel flavor! @Leilani I have those GetSuckered flavors. I’ll take pics of them. Give me a few. I have not solo tasted these but I did just taste them off my hand and they are definitely different. It almost seems like they took the get suckered flavor and added a ton of vanillin to it. I don’t have anymore of the flavor shack pound cake to compare. I have not @GalacticResidue, I only got what I have through word of mouth recommendations. I probably should at least try one or two though. Thank you JJL for the comparison contrast! That is really useful information to know. The Vanilla PG by GetSuckered is fairly dark in color - is it more of a rich & creamy vanilla or a dark & bold vanilla? Try their French Vanilla. It’s really close to the Holy vanilla, might even be it, I just haven’t tried the stronger formulation, yet. (on its way). They have two kinds of the French Vanilla - he said it was the one that did not state “Stronger”. Mine is the stronger version. Or as on the label 2x stronger. It’s a dark bold vanilla. It’s real close to holy vanilla bit it’s also missing the sweetness that holy vanilla has in it. If this “stronger vanilla” is what flavor shack uses they probably add a little sweetener and vanillin to it. If they added those two items it probably would make it lighter. Natural & Artificial Custard Flavoring- (PG). Does not contain Lactic Acid.• Does contain Diacetyl, Acetoin or Acetyl Proprionyl. Thank you for describing the Vanilla flavor to me. That is very useful regarding the “2x = Stronger” version. Thank you JJL. I am definitely more interested in acquiring this Vanilla and the French Vanilla. When I ordered Holy Vanilla from DIYFS I asked if they could send some samples my way. Never hurts to ask right? They sent me Toasted Marshmallow and Cream. The toasted marshmallow was good, just difficult to find a place in my recipes. The Cream on the other hand was absolutely amazing. Not only is it a delicious cream flavor but I was amazed at how good it is as a shake and vape. No steeping required. For any kind of cream/milk base to be this good right out of the bottle is a real game changer for me. If you enjoy creams with your fruits, this may be right up your alley, especially given how many creams can mute the top notes of some fruits. With almost no steeping time, you can shake and vape your favorite fruit and cream recipe without the wait or muting. Your mileage may vary, but I absolutely recommend giving their Cream a try. Which cream by chance are you referring to lol! DIYFS Chocolate Toffee Dream is a winner among their chocolates in my book. Awesome thx for this info!